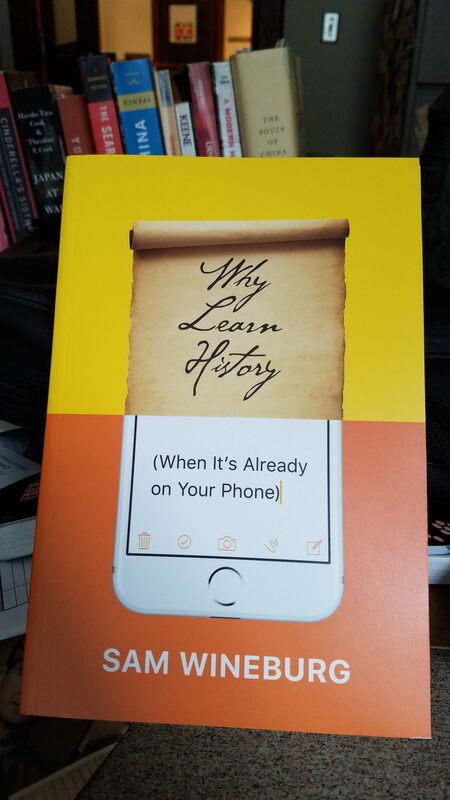 Like a lot of people, I got my copy of Sam Wineburg’s new book Why Study History (When It’s Already on Your Phone) [University of Chicago Press, 2018.] in the mail this week, and since I’ve literally just finished taking my Historiography class through Historical Thinking and other Unnatural Acts, I thought I should review it and see if it represents a great leap forward, etc. Having read it, I can say with some certainty that it is not replacing Historical Thinking in next year’s iteration of this class. It’s a cranky book, with a kind of frustrated prophetic tone: my comment on twitter was that the title should have been Why Teach History (When You’re All Doing It Wrong). It starts well enough, with a history of standardized testing and the relationship between those ‘normed’ systems and the constant repetition of ‘kids these days don’t know history’ that never seems to acknowledge that we’ve been complaining about that for as long as we’ve been measuring it. And his attack on Zinn’s work is mostly critiques that could have been targeted at a *lot* of more current textbooks. He’s basically griping that People’s History and the teaching materials that have come out of it are no better than average. E.g., his argument about the lack of up-to-date historiography on critical questions (atomic bombings, Soviet spies): how many chapters in current textbooks have “reading recommendation” lists from the authors’ grad school bibliographies, plus a token new work or two? (This is a pet peeve of mine.) Wineburg basically argues that newer scholarship must be better, but ignores that there are critiques of much of it, ongoing arguments. E.g., the idea that Soviet spies’ existence mitigates the political and social damage of McCarthy/McCarthyism is a bit of a non-sequitur, especially since we don’t have equivalent open sources on CIA work during the Cold War. And he attacks the textbook-like secondary materials, like primary sources and lesson plans, that have arisen around it for being … a bit less good than his own primary source lesson plans, but doesn’t give them credit for being better than a lot of other textbook ‘resources for teachers’ which are mind-numbing pedagogical atrocities. The chapters on “Historical Thinking =/= An Amazing Memory” are basically recapitulations of the work he did in Historical Thinking. Chapter Six is the beating heart of this book, though: a career autobiography about how he revolutionized the field and got everything right. He’s not really wrong, it’s just not particularly interesting reading when it’s mostly about when he got the insights, who he worked with, how much money they got in grant money, and how many downloads that enabled. There’s about four chapters worth of good methodological potential here, but it’s overwhelmed by his cleverness: reminds me a lot of the self-reported careers of Silicon Valley “disrupters.” (I was particularly struck, given the ill temper of chapter 3, by his recognition that in some classrooms with english language learners and diverse populations, textbooks help). The last chapter, which feels like an afterthought at best, is a recycled version of this article about who people pick as “famous Americans” as some kind of paean to the success of broader educational goals and narratives over the last half-century. “The kids are alright” is an odd ending to a book that is almost entirely about what everyone else has gotten wrong but him and his collaborators. I honestly don’t know who this book is for. It’s certainly not for students or non-teachers. Insofar as it’s for teachers, it’s not the inspiring-but-cautionary work promised by the title. It’s an odd mix of triumphal progressions and cautionary tales, without enough detail to be useful except as a bibliography update to the earlier work for further reading. P.S. I realized after posting this that it really said almost nothing about teaching Asian history. That’s because Wineburg says nothing about teaching anything except American history. Which means that he’s never seriously wrestled with the problem of studying history as anything except as implicit self-study of one’s own culture. Even the study of modern Europe, or earlier manifestations of Western civilization are terra nullius in this pedagogic world, to say nothing of the wider World History revolution or specific study of non-Western cultures. Glad you saved me from buying this. I really liked his old book, although I have never assigned it. I am particularly disappointed that he did not do more with the Google research thing, since I often talk about that in class and would really like something more from him to assign on that topic. I like Historical Thinking as a reading for historiography, especially early in the semester, because it introduces pedagogy (and public memory) as something to think about seriously. It gets students thinking about their own experiences with history pedagogy, and a lot of our graduate students are current or prospective teachers who often haven’t had any discipline-specific pedagogy training. The title really threw me off: I expected a lot more like the Google stuff and the importance of contextual knowledge, and really hoped it might be student-appropriate. As I said, the original Google article and Kelly stuff is pretty good, but other people have done more.